Everyone loves a good excuse for a delicious treat and natter with friends and these tasty bakes will make the occasion gluten-free and fun. The double chocolate brownies are gooey and rich with chunks of milk chocolate, while the shortbread pieces, plump raisins, and indulgent dark Belgian chocolate in the Tiffin add a sweet, fruity crunch. The rich, moist fruit cake made with rice flour is delicious, and the vanilla shortbread melts in the mouth. Served with a choice of fresh coffee and organic tea, all carefully hand-packed in a vibrant red box and delivered to the door. 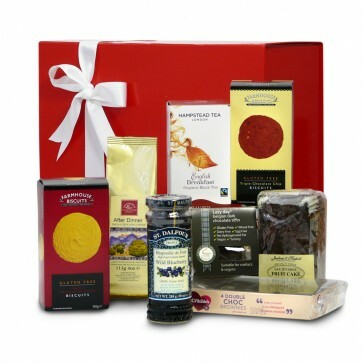 The gluten free food and drink in the Afternoon Tea Gift Hamper is carefully packed by hand in a gorgeous red gift box. If substitutions are required, you will receive items that are the same (or higher) value and that will compliment your original selection. Remember to tell us what you’d like written on the personalised gift card included inside. Want to add items to your hamper? 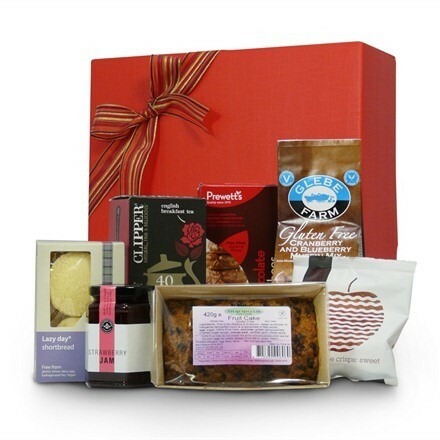 Can I change items in a hamper or gift box in your hamper range? If you have any special requests please do not hesitate to call us on 01360 440066.